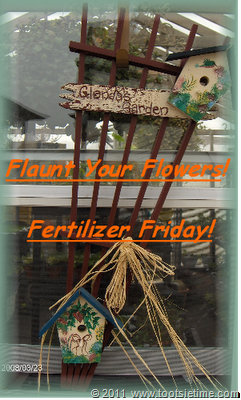 So, it's time to join Tootsie at Tootsie Time for Fertilizer Friday. 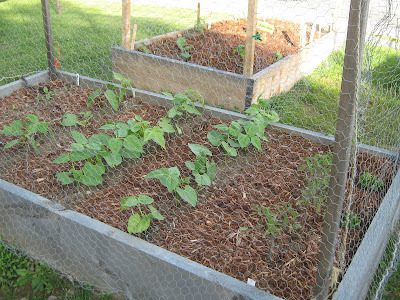 This week, I'm going to introduce you to my other garden --- my little veggie patch with the local Community Garden. This is the 3rd year that the Community Garden has been in operation, and as well as growing literally, it grows in popularity every year. 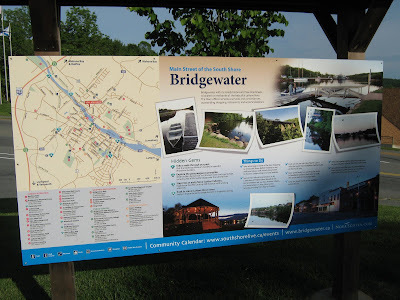 It's hosted by a local group of green-minded people and endorsed by the Town. The Town allows us use of a lovely piece of property in the heart of everything and near the river. 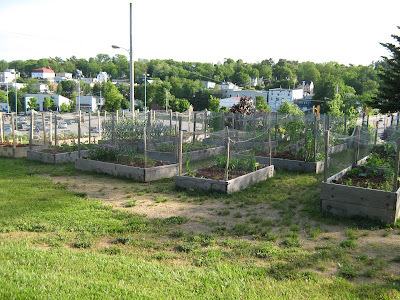 This year, there are 21 raised beds, 18 of them given for individual use and 3 are community beds. The produce we grow in the community beds will be given to the local food bank or stored for use at the community Christmas dinner. This is my little bed: 2 lemon balm herbs, 4 tomato plants, 3 rows of green & yellow beans, and a rather sad row of Swiss chard. I'm so happy to be able to grow veggies again, and I only planted on May 24th so I'm sure I'll enjoy a good harvest. 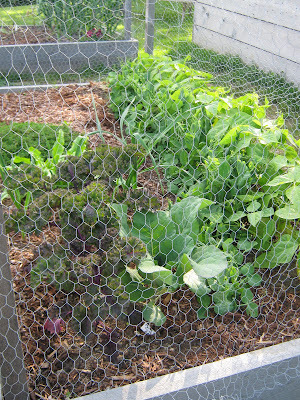 Here are one of the more lush looking beds with broccoli, kale and beans. My garden looks over and aspires to be just like it! 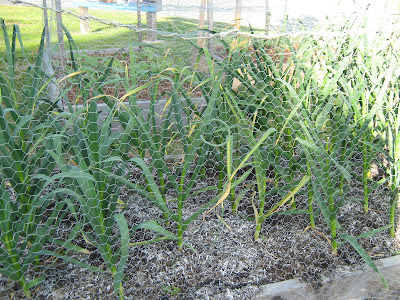 We also have a great looking plot of garlic. Did you know that all of the garlic purchased in our supermarkets comes from China? At least, up here in Canada it does. Shocking really! I've never grown garlic before; in a couple of weeks when the little bud ends (whatever they are called?) curl around on themselves, we can cut them off and use them. .
No more gardening for me until next week. This weekend calls rain for Nova Scotia; so I'll be once more holed up in the basement painting and moving on with my new project! I hope that whatever you're doing, you enjoy yourselves. Happy weekend! I hope you have a fantastic Friday and a SUPER weekend. I love the gardens!!!!! Do they have fence around them for the wildlife? I didn't know that about garlic. Good for you for growing it! I love to see gardens. It makes me think of my Dad as he ALWAYS had a garden. Wish I had a good vine-picked fresh tomato right now! Yay! Another Canadian gardener! I've been considering participating in a community garden like this. I gave up my vegie garden for a pond and waterfall. Now I garden in containers. I realize how lucky I am to have a veggie garden of about 20' x 30'! What I note most about your veggie garden is the total enthusiasm you have for it. I'm sure it will do well with the energy you have for it. girl...I wish we lived closer together!!! I would love to hang out...I am loving your header photo!!!! your garden plot looks very neat and tidy and very healthy!!! won't be long and it will be full and over flowing!